But, do not think for a moment that this means I know nothing about the continuous battle with these critters, I was born and lived in Czech Republic, country with huge wood tick population. And because of that, people down there have been trying all sorts of treatments and prevention, for years, and sometimes come up with great, effective stuff. Since in our household, we are all for the natural - environment friendly - cost effective solutions, I thought of sharing one such treatment here. It has been tried out by a good friend of mine Lenka on all kinds of her numerous pets. It has also been tested by my mom on her cats and several of our retired huskies, who reside with my parents. I got the recipe from my mom and both her and Lenka swear by it. Last summer, I tried it out as repellent on some of the dogs, to see how it would work against mosquitos (you see, here we are with the suckers that complicate our life over here!) and it also worked! So, since for many of you around the globe the wood tick season has officially started, let me present you my two cents. 1. Let water boil. Set aside from the stove, add rosemary and let cool down under a lid. 2. After it cools down completely, filter the contents. You can use a regular medium to large sifter. 3. Add white wine vinegar and stir well. Fuse into jar or bottle, close and store in fridge. For easy use you can pour the infusion into a sprayer bottle. A recycled sprayer bottle from any cleaning detergent, properly washed out, is fine, or you can buy it in a gardening shop. You can also pour part of it into a smaller sprayer bottle and take it with you on your travels, hiking, camping or other trip outdoors. You can spray your pet (make sure to protect their eyes and nose) and yourself as well. If you decide to try it, let me know how it worked! Yes, I am the same way - I wouldn´t use anything chemical if I can avoid it. Please do so, if it works, I would be really glad if it works for more people and pets. Over here, we are fighting mosquitos every summer as we have 24h daylight, it´s really crazy, but at least since we live in a very little populated area, it seems they don´t carry those horrifying diseases. Good luck and hope your dogs won´t get any ticks this year! I am going to try this. I hope it gets rid of fleas also. Thank you! Thank you for sharing this. We had a mild winter and the ticks are awful this year-I will definitely being trying this! Thank you all for your comments, I hope the remedy will work out for you and your animals! Any reason this can't be used on puppies as well? I would use it on puppies without worries. I can't think of anything in this recipe that would make it dangerous for puppies. Hey, was going to mix some up but, I don't have wine vinegar. How about just regular vinegar or Braggs? Or is there something special in the wine vinegar. I have lots of fresh Rosemary, so that is not the problem. There are some areas in the world where ticks are everywhere and they can be lethal. My cousin was bitten by a tick and it ended up giving him limes disease. 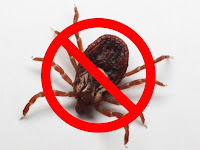 That right there helped me see that it's smart to not only check yourself for ticks when you are in the outdoors, but to do all that you can to control it and keep it away from your home.